Surrey have won the County Championship for the first time since 2002 after beating Worcestershire by three wickets. Led by 66 from captain Rory Burns, the top run-scorer in domestic first-class cricket, Surrey chased 272 to seal the title with two games still to play. The England hopeful shared 111 with Mark Stoneman (59) for the first wicket to put them in command at New Road. Worcestershire, bottom of Division One, fought back with three wickets before lunch but Ollie Pope’s 49 helped the visitors home. Morne Morkel hit the winning runs, after Pope was bowled by Dillon Pennington with 32 still required, to end their 16-year wait for a Championship crown. “What took them so long?” South Africa great Morkel joked on BBC Radio 5 live. “It’s a special feeling. To clinch the trophy with two games to go is unbelievable. Alec Stewart’s side have won 10 and drawn two of their 12 Division One matches so far and remain on course to finish the season unbeaten. 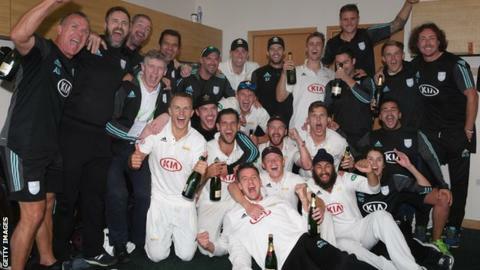 But, while the Surrey players and staff celebrated, Worcestershire were left to rue their own predicament, with the Pears now 20 points from safety with only two games left to play. They had held a 68-run first-innings advantage over their visitors and, with Surrey at 157-3 and then 260-7 in their second innings, were still in with a slight chance of causing an upset. However, veteran Rikki Clarke struck a composed unbeaten 18 before Morkel guided a short Pennington delivery to fine leg for four to complete the chase. It was fitting that Burns, who now appears destined for a place on England’s tour of Sri Lanka following Alastair Cook’s retirement, was to play a significant role in their decisive victory. The 28-year-old has passed 1,000 runs for the fifth successive season and his half-century, which followed a fourth Championship ton of 2018 in the first innings, laid the platform for the win that confirmed Surrey as champions. “I did think we had a squad good enough to win the title, but I didn’t think it would happen in the manner we’ve done it,” said Burns. “The journey this club’s been on, there’s been a lot of building to this point and it’s great to get over the line. In addition to his last-day heroics with the bat, Morkel has also been a key man with the ball and it was his 5-24 – his fourth five-wicket haul of the season – that kept the visitors’ target down on the third day. The 33-year-old has been ably supported by all-rounder Clarke and brothers Tom and Sam Curran, both of whom have earned call-ups by England in the past 12 months as reward for their domestic form. Pope looks likely to be Surrey’s next home-grown product to make a mark on the international stage, already appearing in two Tests this summer and known to be highly-rated by chief national selector Ed Smith. 10 – Surrey have matched last year’s champions Essex for number of wins with two games to spare. Another victory would see them equal Yorkshire’s 2015 record of 11 (from 16 games) since the Championship split into two divisions. 5 – half of Surrey’s victories have been by an innings. 592 – Surrey’s second-innings total against Nottinghamshire at Trent Bridge is the highest team score in the County Championship this season. 199 – Burns and Ben Foakes put on Surrey’s highest partnership of the season, for the fourth wicket against Hampshire. 0 – knockout games played by Surrey in limited-overs cricket this season after they were eliminated from the group stage of both the One-Day Cup and T20 Blast.